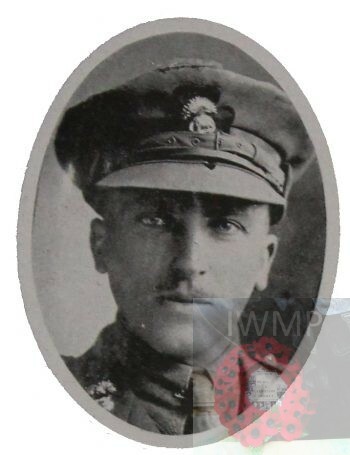 Died: 26th January 1916; age: 30; KiA at Loos. Residence: Ballyhubba Charleville, County Cork, Ireland. Occupation: District Inspector – Royal Irish Constabulary, of Charleville, County Cork. Osborne served as a Lieutenant in the 3rd Battalion, of the West Yorkshire Regiment from 1906 – 1911. He resigned and was appointed to the Royal Irish Constabulary from 1911 – until November 1914. Date of Entry Therein: December 1915 – France. Regiment: Royal Munster Fusiliers, 8th Battalion ‘C’ Coy. Relatives Notified & Address: Son of the late Rev. W.H. De Courcy Baldwin & of Mary Osborne De Courcy Baldwin, of “Mickledown,” Ewell, Surrey. 1891 Diocesan Training College, St. Maurice, York, Yorkshire. Osborne was 6 years old and living with his father & sister. Godfrey William Henry De Courcy Baldwin, 53, Principal of Training College, born Ireland. Blanche De Courcy Baldwin, 4, born York. 1901 Pocklington Grammar School, East Yorkshire. Osborne was 15 years old, a Student and Boarder at the independent boys school. School Master – 43 year old, Charles Frederick Hutton, a Church of England Clergyman. 1911 Newtownbarry, County Wexford, Ireland. Osborne was 25 years old, a Soldier ranked 3rd Lieutenant, for the West Yorkshire Regiment. He was a visitor to widower, Francis Guilbride and his daughter. Francis Guilbride, 69, a Master Miller – Corn, born Co. Wexford, could read & write, and of the Irish Church. Isabella Langford Guildbride, 28, born Co. Wexford, could read & write, and of the Irish Church. In 1911, at St. Edmund’s, 15, Hatfield Road, Ipswich, Osborne’s 53 year old mother, Mary Osborne De Courcy Baldwin (nee Rowe), a widow, born York, Yorkshire, was living with her widowed mother, 86 year old, Harriet Elizabeth Rowe (nee Baker), born Hargrave, Northamptonshire. Both of Private Means. Osborne’s maternal uncle Edmund Lewis Rowe was the Medical Superintendent of the Borough Lunatic Asylum, Foxhall Road, St. Bartholomew’s, Ipswich. Osborne’s father Godfrey William Henry De Courcy Baldwin died December 1909, of The Rectory, Holtby, York, Yorkshire. Mary Baldwin, of 65, Warwick Avenue, Bedford, Bedfordshire. applied for her late son’s medals on the 2nd December 1921. Probate to Mary Osborne De Courcy Baldwin – mother.